A high quality flooring display stand, or display rack, will essentially promote product itself! Any of the display stands in our web will help to file and sell your floor pieces. These displays are designed for professional applications, from retail shops to showrooms to warehouses. It makes a great way to store your ceramic tiles, hardwood floorings, and so on. 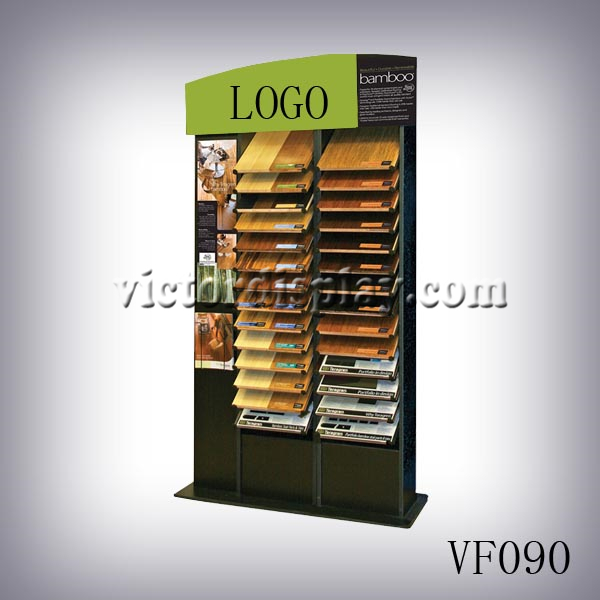 Xiamen Victor Industry & Trade Co., ltd offers a large variety of top quality display racks. Top-quality, well-placed flooring display systems, or even just a single simple rack, will ensure that company marketing materials look more beautiful and attract more attention than ever to potential clients. Our timber floor display racks have the power to highlight or hide the message your showroom is trying to get across, it decorate the showroom, and shine brilliantly with flooring pieces together. We design and manufacture flooring display systems that showcase customers' products in the best way possible. Sort through our available options, we're sure you will find just what you are looking for. We can offer you a complimentary design service to design and layout your retail flooring store or showroom display racking environment. For more information on flooring display stands options, custom layouts and materials, feel free to contact our floor display rack consultants, who can help you create the perfect rack system for your specific needs.